As a Girl Scout, there is a lot a girl can do! Girl Scouting build girls of courage, confidence, and character, who make the world a better place. Individual Girl Scout troops are formed with the same age girls – at St. John, we have existing troops who would love to add new girls, and we try to start a Kindergarten level troop each year. We are part of the Woodland Mounds Service Unit and the Girl Scouts of Western Ohio Council. As part of the service unit, we have outings and events with other girls from some of the schools in the Lakota School District. 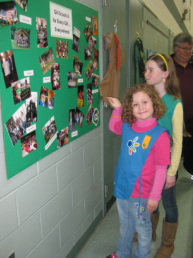 As part of St. John Girl Scouts, we have all troop events that help the St. John community, and we have fun, too. So, what do we do as Girl Scouts? Sell cookies, of course, but there is so much more than that! Some of our annual events are: camping, bowling night, skating night, Operation Christmas Child, Girl Scout Sunday Mass, flower planting in front of church, and much more! Each troop has its own personality and decides what they want to accomplish throughout the year(s). If you are interested in joining Girl Scouts or would like to volunteer, please contact Diane Biehle at 777-4946 or d_ejb4@yahoo.com.